There are two basic ways to increase your chance to sell capital equipment. One is called interruption marketing and the other one creating value marketing. Guess which one is the most used and which one is the most successful? The worst kept secret is that it is value creating based sales/ marketing. Interruption marketing literally interrupts – YOU. Messages pop up on your screen when you do not even expect it. Spam mails clutter your in-box. Clicking on web links first show some sort of commercial. There are many more examples. They make you mad and are extremely frustrating. One particular pesky one may be found in blog and forum responses when well-meaning sales folks try sneaking in their company and personal contact information into comment and response sections. “We do this, that and the other thing, we are great, just give us a call and just start buying from us”. Do they really think anyone will seriously pay attention anymore to this scatter gun approach to sales? Attention is such a scarce thing in our noisy social media world that interrupting the customer’s work achieves exactly the opposite: It turns the attention away and it lands the marketer into the junk folder. It is nothing but a dead end proposition. Creating value is best delivered in genuine and free advice. Free? Yes, at least the overall assessment of a customer’s situation and pointing out the root cause of his issues goes a long way. Only when you have built up enough subject matter expertise can you be of help to anyone and you can deliver this advice. Once you do that built a web presence, help out in special interest group forums, start a blog, and hold presentations. Do not get me wrong here, this is not the same as unpaid consulting. There is no need to be afraid that you will lose out on revenue. Just look at any forum and you will see that the top number one issue is that folks have a rather complex and broad challenge to figure out. Key problem is that they typically have issues where to even start isolating what their real problem is to begin with. That is where you can help. Get them rolling with the basics and the 80/20 rule is that 80% of issue will not go anywhere anyway. Some customers never follow up, or they finally do have a solution, but they will never implement anything because they will never get the money to fix their issue. The 20% of cases may just turn into 80% of your future revenue. Neat, huh? People will rely on you for honest and trustworthy advice. All you need to do is delivering some solid value that makes the customer better off. Most likely he will come back to you for more advice when he has another issue to solve. One simple shot gun spatter of your advertisements will not get you anywhere soon. People will only tune you out. Work on increasing your skill sets and experience. Build and provide solutions. Build up your audience. Become a subject matter specialist. Seek outlets for your stuff and give it away. When customers do start buying from you (trust me, they will) steadily under promise and over deliver. Does this take a little more time upfront to build your customer and sales base? Absolutely. Will this be much more sustainable? Most certainly. Just wait until the first word-of-mouth referrals hit your in-box. P.S. : Use the comment box of this post for your cheap sales pitch and you and your mail will land in the “block sender” file folder. Interruption marketing does not work! Dr Isobel Clark is the author of Practical Geostatistics. What she did in this 1979 textbook took me by surprise. It would have baffled many a thinker who has never bothered to read works of others. She deserved praise because she had derived the variance of the distance-weighted average. Agterberg in 1974, David in 1977, and Journel in 1978 never took the trouble to derive this variance. It’s a bad omen that the distance-weighted average morphed into a kriged estimate on Matheron’s watch. It was Matheron who had failed to derive the variance of this kriged estimate long before geostatistics was hailed far and wide as a new science. Dr IC pointed out on the jacket of her textbook, “Geostatistics is the popular name for the application of statistical methods to problems in mining and geology”. 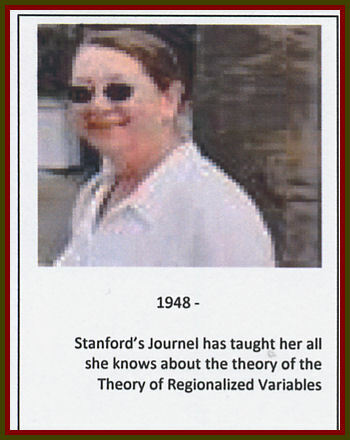 She confessed in her Preface that Journel and others at Fontainebleau, France had taught her all she knows about the Theory of Regionalized Variables. Now that’s what got me worried. Matheron’s way of drawing strings of symbols on a blackboard may well have driven his most gifted disciple to routinely assume spatial dependence. All it took is to assume, krige, smooth, a leap of faith, and a lot of luck! Dr Frederik P Agterberg, too, took a leap from applied statistics to geostatistics. He went from serial correlations in 1958 to functions without variances in 1974. In contrast, Dr Isobel Clark derived not only the distance-weighted average grade of a set of measured values but also the variance of the set and the variance of its central value. Much of it is detailed in Figure 4.1 and Table 4.1 of her textbook and a few pages about her data set. She fretted a bit on page 72 whether or not the Central Limit Theorem would hold. But it always does! Surely, David himself in 1977 would not have written about if it were false. 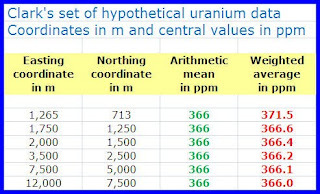 Dr IC’s set of hypothetical uranium concentrations seem to have been measured in hypothetical samples selected at positions with real coordinates in a two-dimensional sample space. I wish she had given the mass of each of her hypothetical samples. She reports that her 95% confidence range for a distance-weighted average hypothetical uranium grade of 400 ppm has a lower limit of 95% CRL=350 ppm and an upper limit of 95% CRU=450 ppm. It doesn’t look too bad, does it? Of course, t0.95;4=2.776 from the t-distribution rather than z0.95=1.96 from the normal distribution should have been used to derive the 95% confidence interval for xbar=400 ppm. But who would split hairs at this stage? Sir R A Fisher was already counting degrees of freedom for small data sets when Dr IC was a cute tot. The question is not so much whether this distance-weighted average hypothetical grade of 400 ppm is an unbiased estimate for the unknown true grade at 1,244 m Easting and 713 m Northing. Of course, I wish I knew her sampling protocol. 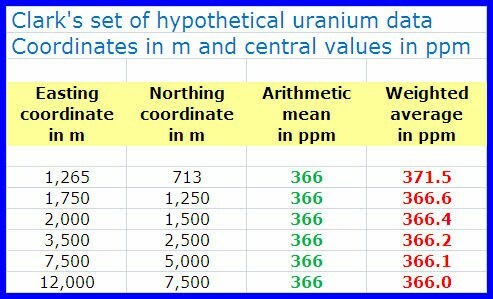 The question is whether it is an unbiased estimate for the sample space defined by this set of five (5) hypothetical uranium concentrations. The most effective method to test for spatial dependence is to do what door-to-door sales people have always done. Travel from point to point such that each point is called on but once and the shortest distance is traveled. The next step is to derive the variance of the set and the first variance term of the ordered set. Finally, Fisher’s F-test is applied to the variance of the set and this first variance term. The observed F-value of 2.07 between var(x)=4,480 for the set and var1(x)=2,161 for the ordered set is below the tabulated F-value of 4.53 at 95% probability. Hence, her set of measured values does not display a significant degree of spatial dependence. By implication, the distance-weighted average grade of 400 ppm is not an unbiased estimate for this sample space. Dr IC did what Journel had taught her to do. All she did was assume spatial dependence between measured values in the ordered set. Here’s what happens when spatial dependence is assumed and functionally dependent kriged estimates are added to measured values. Assume, krige, smooth, and be happy! Dr Isobel Clark has taught a 3-day course at Global InfoMine in Vancouver, BC on May 3-5, 2011. She took students from “no knowledge of statistics or geostatistics to understanding the mysteries of ordinary kriging and its variants in 30 hours (or less)”. I wish I had been there to shed light on that shameless practice of converting bogus grades and barren rock into a phantom gold resource. But then, why rush the good stuff! Who wrote bogus stats, when, where, and why? Professor Dr Roussos Dimitrakopoulos came up all the way from Down Under to chair a Forum on Geostatistics for the Next Century at McGill University on June 3-5, 1993. His task was to honor Professor Dr Michel David for writing the very first textbook on Matheron’s new science of geostatistics. What David didn’t know was how to test for spatial dependence and how to count degrees of freedom. He wrote his first textbook against all odds since he didn’t even know that functions do have variances. I have written a bit about the properties of variances. So, I send by registered mail an abstract to that futuristic forum at McGill University. Some person at McGill’s Conference Office encouraged me in an unsigned letter of March 31, 1993, to submit my abstract to another event. I’ll dig up more bits and pieces about the properties of variances. Dimitrakopoulos likes McGill a lot. In fact, he settled down in La Belle Province after the Bre-X fraud was no longer on his mind. In a candid interview with the National Post on August 15, 2005, he clarified the intricacies behind his valuations of mining projects. Here’s what he said, “You drill a few holes, you think you understand something but what you know is very, very little. Uncertainty means probabilistic models, and there are a gazillion types of them.” How about that? Some mining investors might wonder how RD selects the least biased probabilistic model. Peter Ravenscroft, a senior executive with Rio Tinto and an expert at geostatistics himself, thinks what RD does is kind of cool and gave him a stack of dough. Professor Dr Roussos Dimitrakopoulos was present at APCOM 2009 in Vancouver, British Columbia. The first line of his abstract reads, “Conventional approaches to estimating reserves and optimizing mine planning and production forecasting result in single, often biased forecasts.” I wonder what would have happened if Stochastic Mine Planning Optimization: New Concepts, Applications, and Monetary Value in an Ever Uncertain Market, had been applied to Bre-X’s exploration data. Financial institutions should demand that the International Organization for Standardization set up a Technical Committee on Reserve and Resource Estimation. It’s long past due. Matheron thought he was a statistician in 1954. Yet, his Note Statistique No 1 shows he didn’t know how to test for spatial dependence between metal grades in ordered core samples. Neither did he know how to derive the variances of length-weighted average lead and silver grades determined in core samples of variable lengths. So much for Matheron’s new science of geostatistics! Dr Frederik P Agterberg wrote in 2000 that Matheron was the Founder of Spatial Statistics. Matheron thought he was a statistician in 1954 when he wrote his Note Statistique No 1. He didn’t write about spatial dependence between metal grades of ordered core sections with variable length. He did derive length-weighted average lead and silver grades but didn’t derive the variances of these central values. In 1907 he stirred up “Brownian motion on a straight line.” He did so because he liked Riemann integrals better than Riemann sums. 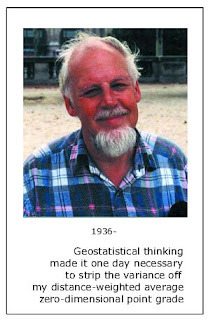 He wrote in his 1978 Foreword to Mining Geostatistics why he proposed the name geostatistics in the 1960s. Professor Georges Matheron would have been shocked had he read in his obituary that he was the Founder of Spatial Statistics. Agterberg invited me on October 1, 2004, to present my views at the next IAMG annual meeting in Toronto. I happen to know a lot about IAMG events where geostatistocrats talk bafflegab. I would rather make my case against bogus stats at APCOM 2009. Dr Michel David wrote a few words of caution in his 1977 Geostatistical Ore Reserve Estimation. First, he wrote, “…statisticians will find many unqualified statements…” Then, he blew the sales of his work by writing, “This is not a book for professional statisticians.” But he was indeed right. David did prove it when he wrote his test for geostatistical proficiency. He took M&S’s set of nine (9) measured values and “estimated” the same set of sixteen (16) what he came to call “…points…” He wrote on page 286 of his textbook, “Writing all the necessary covariances for that system of equations is a good test to find out whether one really understands geostatistics.” Why did the author of the very first textbook on geostatistics fail to derive the variance of each of this sixteen (16) functionally dependent values? Why didn’t he count degrees of freedom? If M&S’s set of nine (9) measured values were evenly spaced, the set and the ordered set would give df=n-1=8 and dfo=2(n-1)=16 respectively. Why is the geostatocracy still asleep at the switch? Why is Bre-X’s massive phantom gold resource all but forgotten? A Marechal and J Serra wrote Random kriging in 1970 to celebrate the first krige and smooth bash in North America. M&S toiled under Matheron’s tutelage at his Center de Morphology Mathematique, Fontainebleau, France. So, why did M&S set out to simplify Matheron’s kriging equations with their own random kriging procedure? Under Punctual Kriging in Random kriging they show how to get a set of sixteen (16) functionally dependent values from a set of nine (9) measured values. M&S didn’t show how to derive a variance of a functionally dependent value. 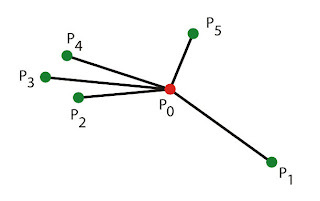 Neither did they show how to test for spatial dependence by applying Fisher’s F-test to the variance of the set of measured values and the first variance term of the ordered set. What Matheron never taught M&S was how to count degrees of freedom. In his own 1970 Random functions and their applications in geology Matheron wrote, “Let us denote a Brownian motion on a straight line.” In Matheron’s mind it somehow seemed to replace Riemann sums with Riemann integrals. Matheron never explained what Brownian motion and ore deposits have in common. M&S put Random kriging “within the geostatistical framework of the French school.” Go figure why! Dr Isobel Clark is the author of Practical Geostatistics. She wrote on the first page of Chapter 5 Kriging, “It would seem sensible to use a weighted average of the sample values, with the ‘closer’ sample values having more weight.” On the same page she wrote, “The arithmetic mean is simply a special case where all the weights are identical.” She wrote in her Preface that Journel and others at Fontainebleau taught her all she knows about the theory of the Theory of Regionalized Variables.” She transposed for “mathematical convenience” the factor two (2) in dfo=2(n-1), the number of degrees of freedom for an ordered set of n measured values. That’s how Clark’s semi-variogram was born. Why did Fisher’s F-test for spatial dependence between hypothetical uranium data fail to make Clark’s grade in her 1979 Practical Geostatistics? And why does nobody care? Statistically dysfunctional geoscientists write all sorts of things that are bound to hound them in time. Read what Stanford`s Journel wrote to the Editor of the Journal for Mathematical Geology. What he did was set the stage for conditional simulation on Stanford stationary. Take note of when he wrote it. And read what JMG’s Editor wrote to me. So, my feeling that geostatistics is invalid might be correct. How about that? He also wrote that different “flavors” of geostatistics may fail at different times. Now that’s kind of cool. I do know which flavor failed in the Bre-X fraud. It was the flavor of assuming continued gold mineralization between salted boreholes. The odd geostatistician might be taught how to test for spatial dependence and how to count degrees of freedom. Most are doomed to assume, krige, smooth, and rig the rules of statistics. Dr Frits P Agterberg is Emeritus Scientist with the Geological Survey of Canada. In the early 1990s he was but one of many scientists with NRCan’s precursor. Several scientists are members of Canadian Advisory Committees to the International Organization for Standardization. I have never met Agterberg at any such event. I derived a method that gives confidence limits for metal contents and grades of mined ores and mineral concentrates. It was approved as ISO DIS 13543, Determination of Mass of Contained Metal in the Lot. What I wanted to do was apply the same method to in-situ ores and coals. Cominco’s geologists taught me a bit about kriging and smoothing but I didn’t get the gist of it. A mining company gave me a set of gold assays for ordered rounds in a drift to play with. My son and I studied a few geostat books. We found David’s 1977 Geostatistical Ore Reserve Estimation to be short on statistics and long on geostat drivel. David did pay tribute to the ‘famous’ Central Limit Theorem but didn’t take to working with it. Neither did he take to counting degrees of freedom. Degrees of freedom played a cameo role when he pointed to an earlier work of geologists. David didn’t derive confidence limits for metal grades and contents of ore deposits. He was right on cue when he wrote “…statisticians will find many unqualified statements…” David didn’t write he would throw a temper tantrum if any one dared to. David was but one of a score of geostat thinkers who thrashed Precision Estimates for Ore Reserves and made a mockery of peer review in the process. But did they ever know how to stake out their own turf! They coined all sorts of terms and never stopped nattering nonsense neologisms among themselves. I’m not gifted in verbal discourse. It took me a while to grasp that kriged estimates, kriged estimators, estimated values, and simulated values, are birds of a feather in geostat speak. What did blow my mind were infinite sets of kriged estimates, zero kriging variances, and a dreadful disrespect for degrees of freedom. Who could have made up so much poppycock? Agterberg made up quite a bit of it. He cooked up a distance-weighted average point grade that didn’t have a variance. He failed to put in plain words why his function lost its variance. Neither did he ever tell me why his zero-dimensional distance-weighted average point grade didn’t have a variance. It led me to guess that this lost variance wasn’t his proudest feat. What is still beyond Agterberg’s grasp in 2009 is one-to-one correspondence between functions and variances. Matheron’s new science of geostatistics drifted across the Channel and the Atlantic Ocean and made landfall on the North American continent in 1970. The mining industry was gung-ho to swallow least biased subsets of infinite sets of kriged estimates with hook, line and sinker. Kriging and smoothing sounded so soothing. How its practitioners could beat the odds of selecting least biased subsets of infinite sets of kriged estimates troubled but a few. The list of those who couldn’t care less would stack a Mining Hall of Shame. I got to the bottom of Matheron’s odd statistics long before the Bre-X fraud. But no one cared! I took my time to find out who lost what, when and where. It was Agterberg who brought to light a typical geologic prediction problem in 1970. I took a look and saw a distance-weighted average. He found a typical kriging problem in 1974. All I saw was the same distance-weighted average. Here are a few of Agterberg’s real problems. He didn’t know how to test for spatial dependence between his ordered point grades. He didn’t know how to derive the variance of his distance-weighted average point grade. He didn’t know how to count degrees of freedom either for the set or for the ordered set. Yet, Agterberg does point to degrees of freedom on pages 174, 190 and 254 of his 1974 Geomathematics. What’s more, Agterberg didn’t take to door-to-door sales walks. Such a walk would visit each point only once and cover the shortest possible distance between all points. He could then have applied Fisher’s F-test to the variance of the set and the first variance term of the ordered set. Agterberg himself did apply Fisher’s F-test on page 187 of his 1974 Geomathematics. And he does refer to Sir Ronald A Fisher‘s work on nine (9) pages! Agterberg does not refer to Dr Jan Visman’s work. Visman was a Dutch coal mining engineer who worked with the Dutch State Mines during the war. His PhD thesis proved the variance of the primary sample selection stage to be the sum of the composition variance and the distribution variance. Visman immigrated to Canada in 1951 and worked with the Department of Mines and Technical Surveys in Ottawa. He wrote Towards a Common Basis for the Sampling of Materials (Research Report R 93, July 1962). The advent of ash analyzers for coal and on-stream analyzers for slurry flows led to a fundamental understanding of what spatial dependence between measured values in ordered sets is all about. Yet, spatial dependence in sampling units and sample spaces stayed as profound a mystery to the geostatocracy as were the properties of variances. Agterberg prefers oral criticism. Once upon a time he did reply in writing. On October 11, 2004, he called me …an iconoclast with respect to spatial statistics and kriging.” He insisted, “By now this approach is well established in mathematical statistics.” He got it all wrong again. Kriging and mathematical statistics have as little in common as alchemy and chemistry. What is ringing kriging’s bell is climate change. That’s were Agterberg’s zero-dimensional distance-weighted average will always have a variance. Whether he likes it or not!